Experience the essential sights of the Melbourne and Victoria, including the Great Ocean Road and Phillip Island’s famous little penguins, with this exclusive 5 day luxury touring package. Everything is included all flights, tours, hotel, cruises and personalised transfers. Enjoy a full day trip to the Great Ocean Road and visit the 12 Apostles as well as informative commentary along the way. Experience one of the most magical sights in the world, the tiny fairy penguins returning to their beach home at night from a great vantage point on your full day Phillip Island tour. Melbourne is one of the world’s most liveable cities - experience what this beautiful city has to offer. Take in Federation Square, serene Fitzroy Gardens, the impressive MCG and the beautiful architecture on show in this city. This package offers a great taste of what Melbourne has to offer. Sense the fashionable cosmopolitan vibe of Melbourne as you arrive into this major city. You will be transferred from the airport to your hotel. You can relax and use the rest of the day to explore your hotel and its facilities, perhaps take a stroll around the neighbourhood and central Melbourne. Vibrant Melbourne is the cultural and event capital of Australia. Its distinct urban villages each have their own forte and flavours. The city is a maze of hidden laneways, chic cafes, opulent bars and off-the-beaten-track boutiques. Experience Melbourne’s gardens, its history, its character and its charm. See Federation Square, the landmark cultural space. Perhaps wander Southbank’s cafes, bistros and bars, see funky Brunswick Street, the upmarket Chapel Street or get a world tour of cuisines in Carlton, Richmond and Fitzroy. See sporting legends like the Melbourne Cricket Ground, Australian Open venue and F1 track. This morning embark on a comprehensive city tour, including special guided walks of arcades, laneways and Queen Victoria Market. This afternoon relax onboard your 2.5 hours of fully guided Yarra River cruise. Discover both downstream from the city to the bustling docklands as well as upstream to the historic areas and beautiful river gardens. Your friendly driver will pick you up in the comfortable air-conditioned luxury coach before sharing experiences, fascinating facts and enchanting stories in the onboard full commentary throughout the morning. Today you will see Old Melbourne Gaol, infamous Lygon Street (cafe culture & 'Little Italy'), prestigious Melbourne University, Royal Exhibition Buildings & Museum, Melbourne Cricket Ground (MCG), Parliament House, Princess Theatre, St Patrick's Cathedral (great photo stop), see Captain Cook's Cottage, visit Fitzroy Gardens (magnificent 150 year old botanical gardens) and see East Melbourne (ornate Victorian terraced homes). Take a special guided walk through some of Melbourne's best arcades and laneways (Royal Arcade, Block Arcade, Centre Place and Degraves Street) and perhaps enjoy a coffee from a local barista. See Flinders Street Station, Federation Square and Collins Street (the swanky Paris end). Visit Queen Victoria Market for a guided tour and the opportunity look for a bargain and absorb in the vibrant cosmopolitan atmosphere. Take a guided walk through Chinatown and take in the character of this colourful area. The Yarra River is the meandering heart of Melbourne. Enjoy time to explore Melbourne at your own pace for the rest of the day. Melbourne Tour, Special Guided Walks, Overnight Accommodation. The famous Great Ocean Road is one of the world's most scenic coastal drives, featuring the rugged splendour of the famous 12 Apostles, high coastal cliffs overlooking the deep-blue waters of Bridgewater Bay, quaint townships, shipwrecks, iconic surf breaks and spectacular waterfalls. The Australian National Heritage listed Great Ocean Road is 243km long stretching between Torquay and Warrnambool. It was built by returned soldiers and is the world's largest war memorial, dedicated to casualties of World War I. 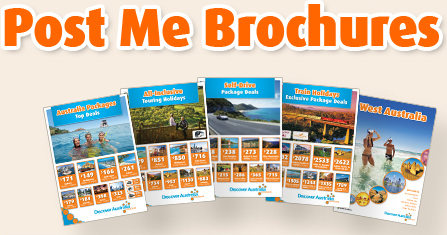 Today you will discover the Great Ocean Road from Geelong to Bells Beach touring through Torquay, Lorne and Apollo Bay. Enjoy the views of Melbourne and Port Phillip Bay from West Gate Bridge as you leave the city. Travel to Torquay and the Surf Coast and see the start of the spectacular coastal views along the Great Ocean Road. See the surf beach resort of Lorne, precipitous coastal cliffs, long sandy beaches and rolling surf, river inlets and fern gullies. Stop at picturesque Apollo Bay for some free-time, lunch and perhaps a walk along the beach. See Otway National Park (fern gullies and eucalypts make up this beautiful Australian rainforest) and Port Campbell National Park's rugged coastline. There are many stops along "The Shipwreck Coast", including Gibson's Steps (gain a unique perspective of the stunning Apostles from the water's edge), Huge stone monoliths of the Twelve Apostles (you can also take an optional helicopter flight over the shipwreck coast, own expense), The Island Arch and Razorback (grand architecture carved by surf), Loch Ard Gorge (shaped by the wild Southern Ocean and site of the tragic shipwreck of the "Loch Ard") and Port Campbell (holiday resort and fishing village). You will leave the Great Ocean Road with more respect for the powerful forces of our oceans and a greater understanding of the communities and history of this region. We recommend taking a windbreaker and walking shoes. As you arrive back into Melbourne see the spectacular evening lights of Melbourne from the famous West Gate Bridge. 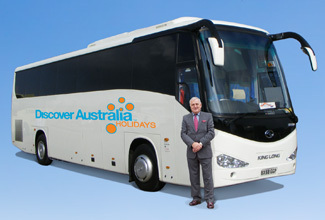 Luxury Coach Tour with Hotel Pick Ups, National Park Fee, Bush Billy Tea, Overnight Accommodation. Time this morning to relax and explore more of Melbourne, perhaps use the Circle Tram Tour again. You can explore the shops, laneways and trendy cafes that make Melbourne well known. This afternoon you will set-off to witness one of nature's most remarkable gifts, a massive parade of wild penguins returning from the sea to nest in the sand dunes. This nightly ritual of the flightless little penguin occurs on Summerland Beach on Phillip Island. Be enthralled as you observe them from the beach and the special elevated boardwalk. Phillip Island is also steeped in motor racing history, the racing circuit is used for the Motorcycle Grand Prix and was used for the original Australian F1 Grand Prix in 1928. But it's the rich wildlife that makes Phillip Island a very special place, such as seals near the sea, basking in the late sunlight on half-tide rocks and content koalas peering down from the gum trees where they live. Head south east from Melbourne towards Phillip Island and enjoy an introductory video "The Little Penguin". See Western Port (water birds and mangroves), the Panoramic views of French Island, San Remo (maritime fishing village). Spot for seasonal birdlife at the island wetlands. Visit Churchill Island for some free time. Opportunity to meet wallabies and kangaroos. Arrive at Phillip Island Nature Park (a natural home for koalas, seals, shearwaters and little penguins). Stop at the Koala Conservation Centre (look for koalas in their natural habitat from tree top boardwalks). See The Nobbies (rugged rocky outcrop) and Seal Rocks (home to Australia's largest colony of fur seals). Witness the Penguin Parade on floodlit Summerland Beach from our premium viewing area for the best views of the penguins, with a souvenir gift and drink included. See penguin rookeries from an elevated boardwalk. Spend time at the Visitors Centre, an opportunity to learn about the life of the little penguin. During your evening return to Melbourne, a panoramic Victorian feature video will be screened. We recommend bringing warm, waterproof clothing as nights can be cold on the island, even in summer. Remember the Penguin Parade is a natural phenomenon taking place at the windswept ocean front. A dinner stop will be made before or after the Penguin Parade (dependent on season and at own expense). This evening is an amazing and totally unique encounter with nature that will stay with you for life. Luxury Coach Tour with Hotel Pick Up, Premium Viewing Area Penguin Parade, Souvenir Gift, Complimentary Drink, Overnight Accommodation. Time to say goodbye to beautiful Melbourne, your fellow travellers and friendly hotel hosts. Your transfer will take you back to Melbourne Airport to meet your flight home. You have 3 choices of accommodation in Melbourne. Our "Good Standard" central Melbourne hotels have great facilities, a comfortable room and friendly service (typically 3.5 stars). Alternatively, why not treat yourself? The "Deluxe" hotels have superior facilities, stylish rooms and first class service (typically 4 stars). The “Luxury” hotels are upscale with a more luxurious feel for the discerning traveller and great for celebrating an anniversary (typically 5 stars). You will be transferred from the airport on arrival in Melbourne to your Melbourne hotel. You will also be transferred from your hotel to Melbourne airport for your flight home. You’ll receive the FREE DISCOVER AUSTRALIA Bonus Voucher Book that includes $500 value of discounts and bonuses throughout Melbourne and Victoria at shops, restaurants attractions, wineries etc. It’s a great way to save even more on your Melbourne holiday. The Melbourne Essentials is very popular. Many dates book out well in advance, please book soon.